The automotive world has long been fascinated by the competition between Ford and Chevrolet, which is the most heated rivalry the industry has even seen – and probably will ever see. But if you look at how new Ford trucks and new Chevrolet trucks stack up against each other, you wouldn’t be wrong in wondering why the rivalry is so heated. That’s because Ford trucks routinely outmatch, outperform, and outclass Chevy trucks each and every model year. That’s also true when comparing new Ford trucks with previous model year Chevy trucks, as you’ll quickly learn in this 2019 Ford F-250 Super Duty versus 2018 Chevy Silverado 2500 head-to-head truck comparison. 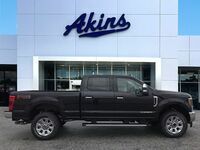 385 HP & 430 lb-ft. Standard Power Ratings 360 HP & 380 lb-ft.
450 HP & 935 lb-ft. Diesel Engine Power Ratings 445 HP & 910 lb-ft.
A truck is only as powerful as its powertrain allows it to be, which is why Ford takes such great pride in crafting the most powerful and capable engines in the industry. As you can see in the table above, the 2019 Ford F-250 Super Duty lineup offers more standard power and more diesel power than the 2018 Chevrolet Silverado 2500 lineup. The 2019 F-250 Super Duty lineup also features more impressive transmission options than the 2018 Silverado 2500 lineup. 21000 lbs. Max Towing Rating (Conventional) 14500 lbs. 27500 lbs. Max Towing Rating (5th Wheel) 18100 lbs. 7640 lbs. Max Payload Rating 3534 lbs. Those more powerful 2019 F-250 Super Duty engines also allow the lineup to tow and haul more than the 2018 Silverado 2500 lineup – as outlined in the table above. 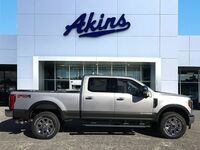 For more on the 2019 Ford F-250 Super Duty lineup, please contact our staff here at Akins Ford near Atlanta, GA. 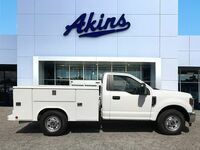 Interested in a Ford Super Duty F-250 SRW?